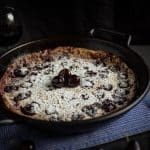 This easy cherry clafoutis recipe makes an impressive yet simple dessert of roasted sweet cherries in a rich, flan-like custard. I love desserts that look impressive but are actually incredibly simple to make. 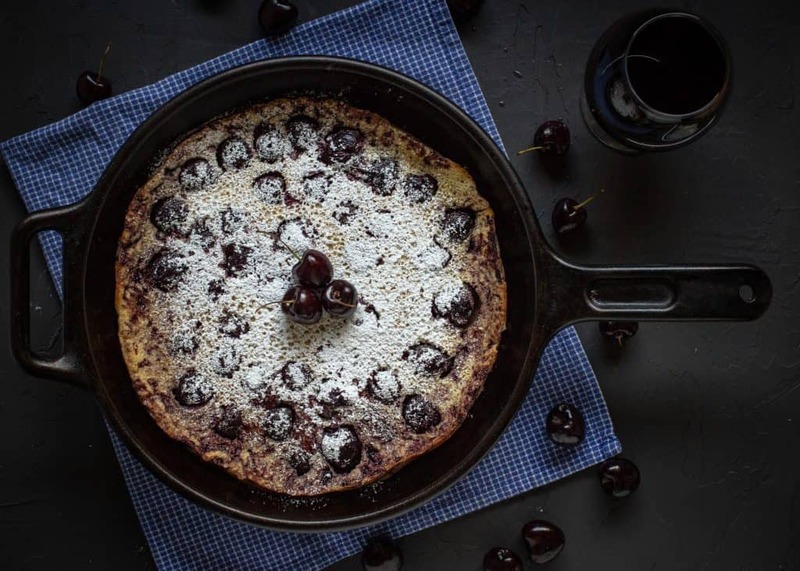 Cherry clafoutis is one of those desserts – all you need to do is blend the batter, add some cherries, and bake. The result is a creamy, cherry-filled, flan-like custard. So what is clafoutis and how do you even pronounce it? 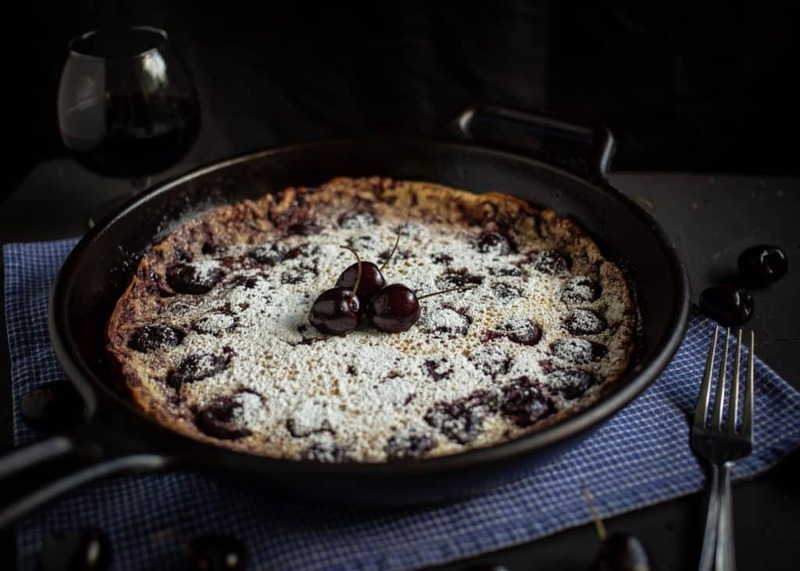 In a traditional cherry clafoutis, the cherries would not be pitted. I personally don’t like eating around cherry pits in my desserts so I chose to pit mine first. This is the only time-consuming part of the recipe. 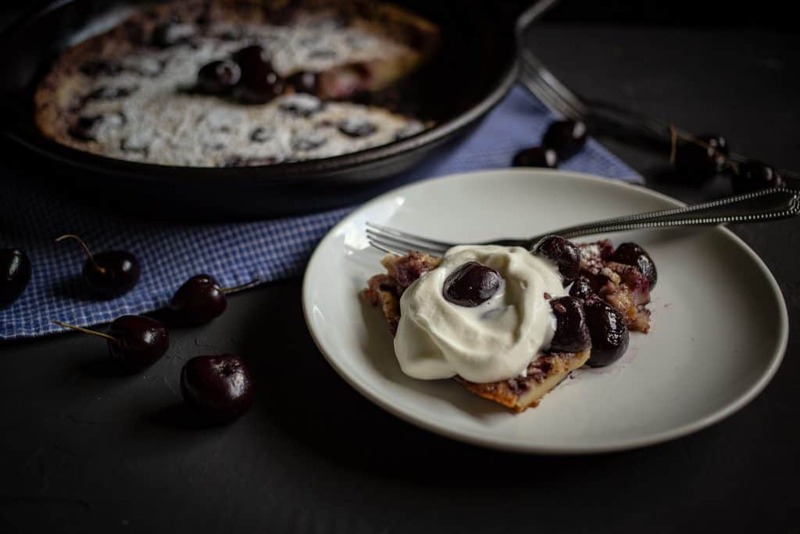 The first time I made cherry clafoutis, I used a paper clip to pit the cherries based on this guide from The Spruce Eats. It worked pretty well, but wasn’t perfect. Since then I purchased a cherry pitter like this one which is far easier to use. Once the cherries are pitted, the rest of the recipe is a breeze. Preheat the oven. Add butter and the pitted cherries to a cast iron skillet and allow to roast while the oven is preheating. Combine milk, eggs, sugar, salt, flour, and vanilla extract in a blender and pulse until mixed through. Take the cast iron out of the oven and pour the batter in. Bake until set. While baking, whip the cream. Then when the clafoutis is done, sprinkle powdered sugar on top and serve with the whipped cream. Cherry Pitter – You can pit the cherries with a paper clip, chopstick, or another manual way, but it’s far easier to use something like this inexpensive cherry pitter. Cast Iron Skillet – A cast iron skillet will last you for years, just be sure to follow the instructions to season it and never use soap! 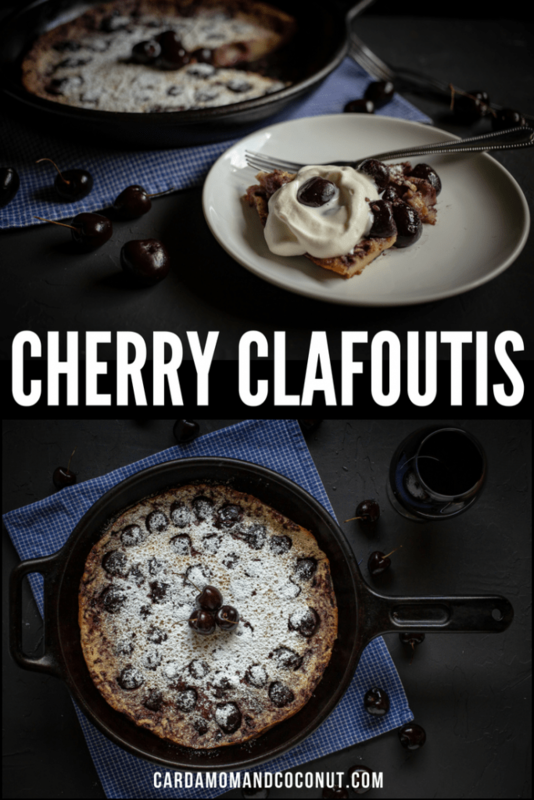 If you try my recipe for cherry clafoutis, please leave a review and comment below to let me know what you think! 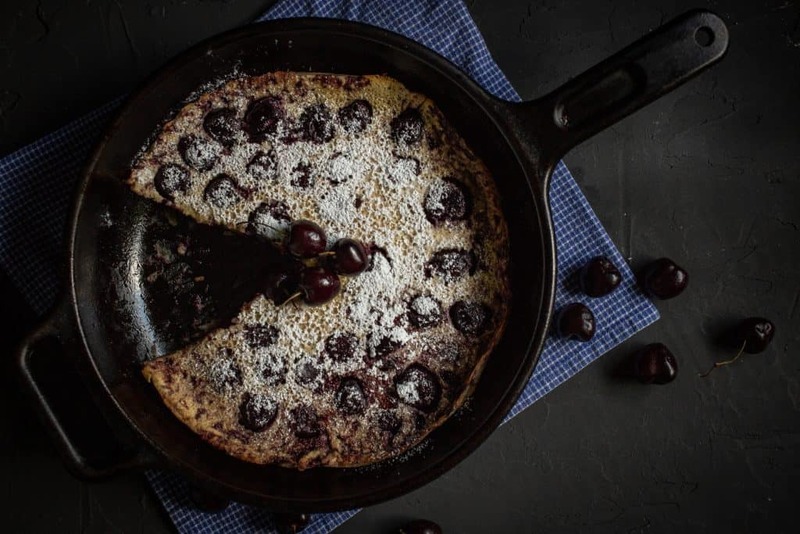 Place the butter in a 10 to 12 inch cast iron skillet or similar sized baking pan and add the pitted cherries. Place in the oven while it's preheating and leave the cherries to roast for about 15 minutes. Meanwhile combine the milk, eggs, sugars, vanilla extract, salt, and flour in a blender and pulse until fuly mixed through. Bake for 20 to 25 minutes or until set. While baking, prepare the whipped cream. Combine the cream and powdered sugar in a bowl and beat with a mixer or by hand until stiff peaks form. Allow the clafoutis to cool for 5 to 10 minutes, then sprinkle powdered sugar on top and serve with whipped cream. My hands were stained red after pitting all of them the first time! So glad I invested in a cherry pitter. So delicious and easy to construct. Thanks for another great recipe! 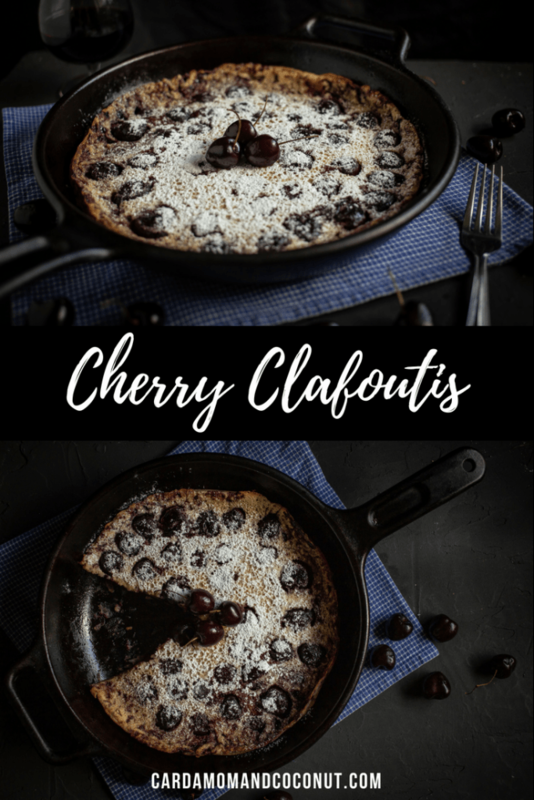 Clafoutis is one of my favorites when it comes to cherries!! Easy to make, but at the same time, elegant and delicious! I love easy & elegant desserts! This is my kind of recipe, so easy and simple to make. I’m happy for my cherry pitter to make my job or pitting cherries easier. I agree! My life was so much easier when I finally got a cherry pitter.